Printing experience can't get any better. If you don't believe it, get home the Canon Pixma MG2570S and feel the difference, all by yourself. 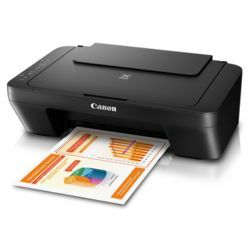 This incredible device by Canon is an affordable All-In-One printer with basic printing, copying and scanning functions. This compact sized printer can easily fit into even the smallest of spaces and shelves in a home or your offices. It features an amazing function Auto Power ON wherein the printer detects a print command and will automatically switch the printer ON with a USB connection. The printer supports affordable ink cartridges for high-quality printing at the least prices. sFCOT / Simplex Approx. 31secs.